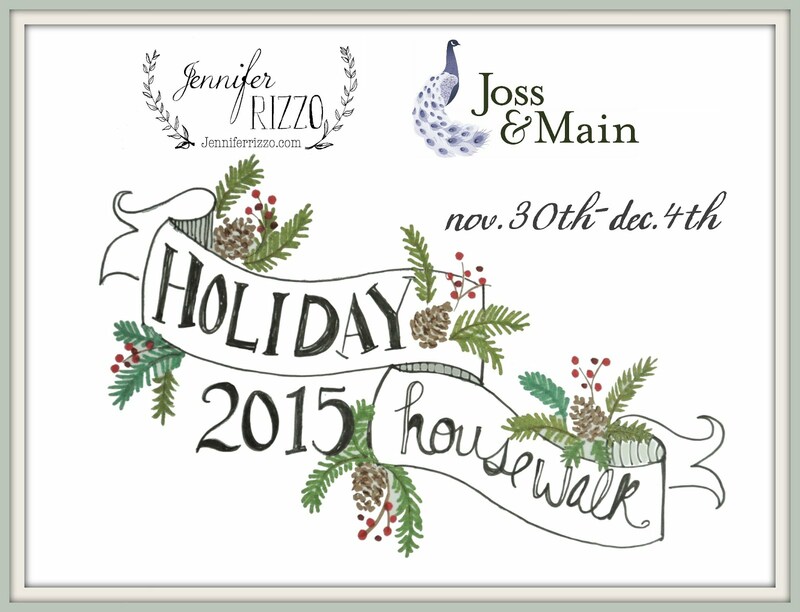 Susie Harris: Deck the halls...and lights! 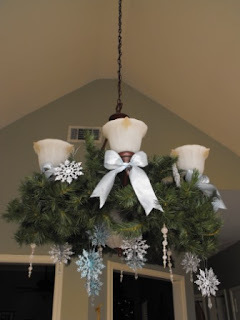 I decorated my chandlier over the dining table last year for the first time and I thought it looked good till I saw yours this morning *smiles* Girl you have it going on! Yours looks so beautiful and I love you went the snowflake and icicle route, you can leave it up well into January. Another beautiful idea Susie! This looks AMAZING! I love that it will take you all through the winter and not just the holidays (if you so choose). If I attempted something like this it would look like a cat exploded or something. This is absolutely stunning!!! So, what color ya painting? And will it be done before the holiday? I love it!!!! O.K.-off to dollar tree I go!Thanks for sharing and have a blessed day! So pretty! 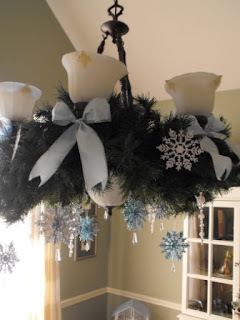 I was going to do my dining room chandelier in just snowflakes without the garland. But yours looks so pretty that I think I'll add the greenery too. 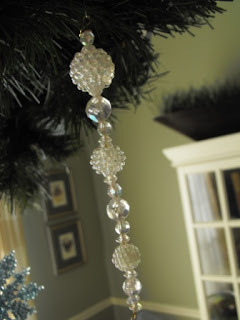 Don't you just love when you can find things at the Dollar Store and make them come together like this...Beautiful! You find the best stuff at Dollar Tree! 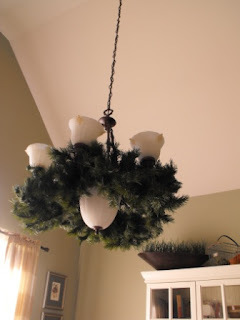 I'm going to decorate the light fixture over the farmhouse table this year. When we get home from the lake, that is. Still some decorating to do. Thanks so much for the mention and compliment, Susie! The paint is Sherwin Williams' version of satin (SW Interesting Aqua, with Topsail on the ceiling. Beautiful! I love the blue also. That color is calling to me in my dining room too. I'm trying to figure out how it would fit in with all the red, gold, and green that I already have. OK, that is just STUNNING!! You did a wonderful job!! 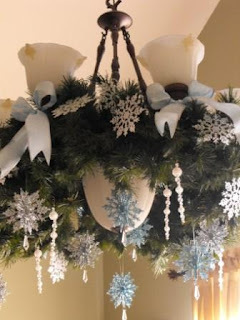 I know that some people decorate "blue" at Christmas but honestly have never seen it in anyone's home that I know. You have done a wonderful job. I have never seen that. Love it. Might have to do that this year. 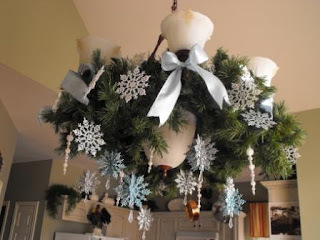 I saw those snowflakes and kept trying to think of a reason to buy them.....now I need a high ceiling...tee heee. Great job!!! Your chandelier is GORGEOUS...you have just that knack for making things BEAUTIFUL!!!!!!! Oh I love this...So tell us how you made your snowflakes that you and your Mom made few years ago? I love that, Susie! 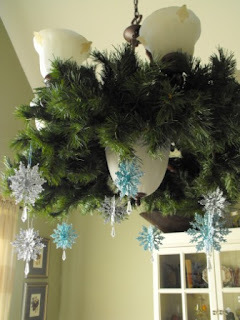 Yep, Pat's blue Christmas decorating is really wonderful, isn't it? Pretty. I love the blue too. It looks so great!! You make me want to step mine up a bit! :) I can't wait to see the rest! BEAUTIFUL... 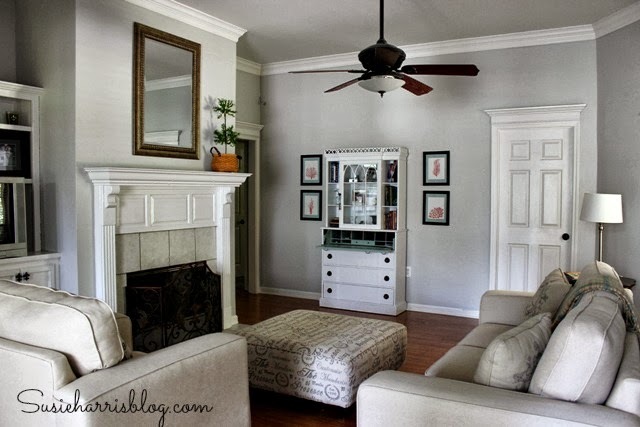 I love it and now wish I had a chandelier to decorate! That looks so cute. 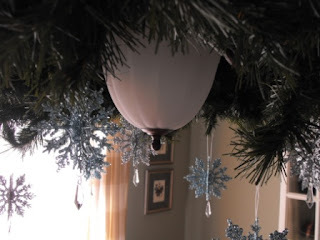 I always hung glittery blue ornaments and garland from our kitchen chandalier. This one looks like my old dining room light in FL. You will have to put up a nak@d photo of it. My husband was shocked when our music minister was over and I told him what I called the light... look at the part hanging down. What does it look like to do. You can find them under your daughter's bed with her barbies. Oh my, it looks magical! Very nice! EEEK!!! I LOVE this!! 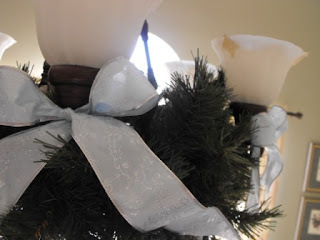 I already hang snowflakes from mine but I am adding that foofy garland and ribbon this year along with it! GORGEOUS! Who woulda thunk it? 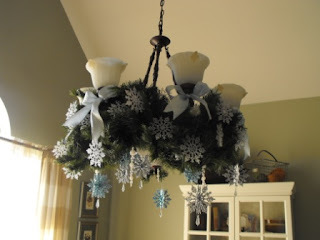 A light fixture all dolled up for Christmas...I love it. 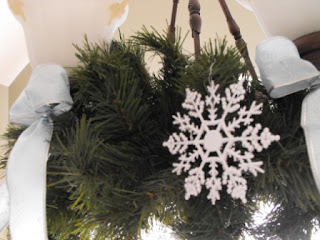 I also LOVE those snowflakes witht the little crystal bauble...precious! 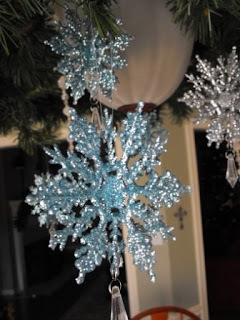 I am all about snowflakes for Christmas! 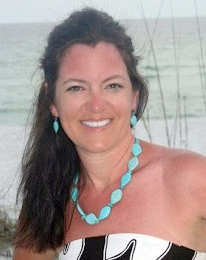 The light is just as beautiful as can be sweet Susie! That is beautiful. I think we must shop in different calibers of dollar stores! The ribbon and snowflakes are nice. 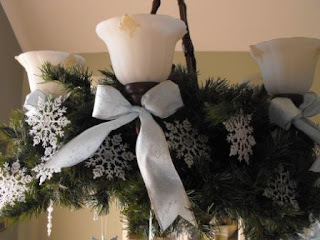 I LOVE that you put the snowflakes in the garland too, not just hanging. Adorable. I do something similar but not nearly as pretty!! Very pretty - love the blue! Stunning! I have always loved the silver/blue theme for the winter, but always thought it clashed with my house. This is so tempting!! Love that it's stuff from the dollar store too. Since you're getting your pretty decorations up so early, are you going to come and help me with mine?!?! 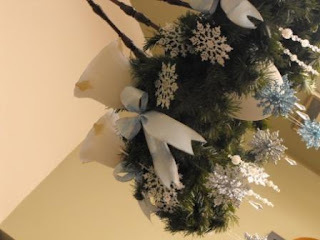 I LOVE this...I'm soo gonna do this to the ugly ceiling fan in the kitchen. oh! I love this! 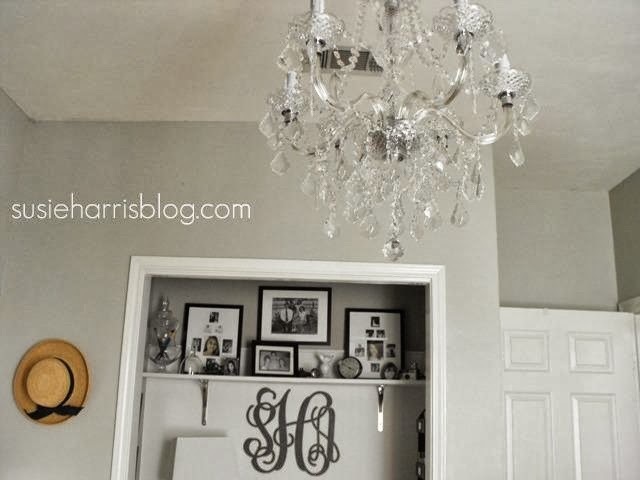 I was just thinking about decorating my chandelier in my dining room...now I know I am definatly going to do it!! That is so pretty. What a great job. 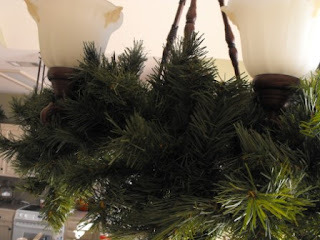 Last year when I was decorating my lights like yours I ran into a problem. ..with all the turning I unscrewed the whole fixture from the ceiling. The only thing keeping the chandilier in place were the electrical wires and my hand. Good thing my husband was close by or I would have wound up crouching in the middle of the dining room table to get everything back in place. So you can bet this year when I decroate it I will be very careful. You are really working hard and everything is so pretty. Happy Thanksgiving Susie. That is a wonderful ideal Susie.It looks so festive now. I love the decorating you did to the chandelier. How beautiful!!!! I can hardly believe all those things came from the Dollar Tree. Amazing. Did I comment on this already? 'Cause I sure wanted to. This is absolute perfection, Susie! You're such a genius. The colors are beautiful! 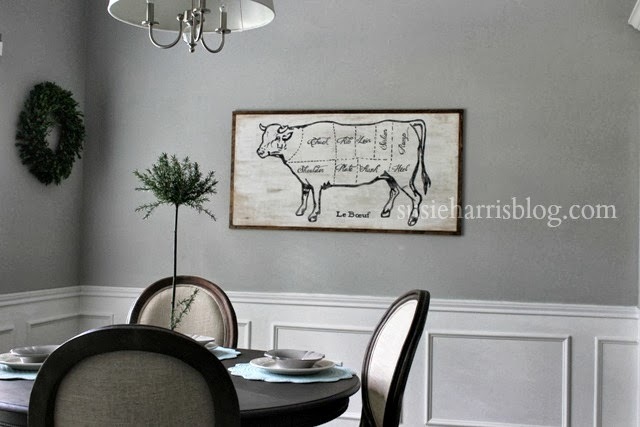 I have to tell you, I LOVE coming to visit your blog and getting such fun ideas for decorating! I am hitting dollar tree TOMORROW!!! CUTE!!!! thanks! I copied this and LOVE it. I even found some of the same things at the dollar store!! Thanks for the insiration.